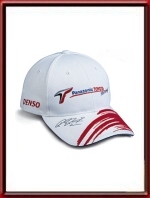 Officially licensed Ralf Schumacher Toyota F1 hat. 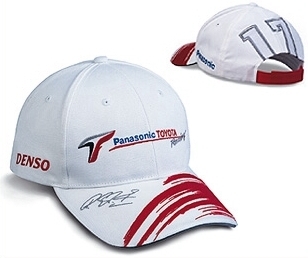 The cap follows the color scheme of the Toyota team with the red brush stroke graphics and Toyota F1 Panasonic logo on the front. Features Panasonic and Denso sponsor logos on the sides and Ralf's signatures embroidered in silver color on the peak. The back features a large "17". A MUST for any Toyota or Ralf Schumacher fan! This is of course official Toyota Merchandise.